Thanks to Mr T for the link! Despite still being used on the front line against ISIS in Syria every day, the iconic Tornado fighter-bomber jets are set to be axed by early next year. 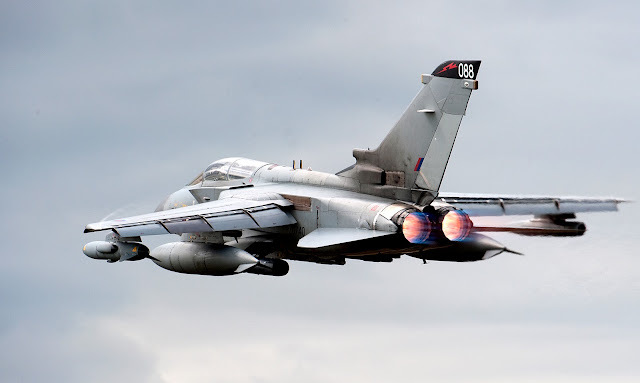 All 36 Tornado GR4s will be decommissioned by the RAF because of defence budget cuts. The bomber was set to stay until the F-35B jet was ready to replace it but budget pressures have forced the RAF's hand early. Air Commodore Andrew Lambert of the UK National Defence Association said that they fought hard to save the Tornados because of the important role they play. He also said that they do not know when they will get the promised 48 F-35Bs.